where you confidently accomplish 10X MORE, increase your chance of success by 1100%, enjoy an overwhelming feeling of personal power and perpetual happiness, and 21 essential areas of your life simply become complete. When it comes to you, my customer, I always think of you as a friend. As I do with all my friends, I consider it my job... no, my responsibility... to get into your hands and mind information that is specifically designed to help make your life better. I believe with all my heart that one of our most popular programs will do just that. But more on that program in a minute. Someone recently asked me which of our programs is the most helpful. That question made me think through all of the programs we offer. I realized that the answer to that question was simple: ALL OF THEM! You see, we consider our programs to be like tools in a tool box. One tool alone doesn’t work for every project. It takes all of them to complete the different jobs that come along. The same is true with our programs. No one program addresses the full spectrum of challenges we face every day, nor do just a few. It takes them all to give us the information and knowledge we need. While it may seem unrealistic to buy every program I write about, I honestly believe that the person who does buy, and use, every one is the person who is in the best position to live the most fulfilling, rewarding, healthy, and abundant life possible. Yet, you can get even further. Self-Mastery is the ability to make the most out of your physical, mental, and spiritual health. To be the best you can be... At anything. Everything. you master your own fate. He shares each and every one with you in his audio program The Miracle of Self-Discipline: The "No-Excuses" Way to Getting Things Done. I want to order now for a limited-time special price! Increase your chance of success by 1100%! This simple yet rarely used ONE-MINUTE trick practically GUARANTEES that your goals become reality. And MUCH MORE throughout Brian's 8 life-changing CDs! 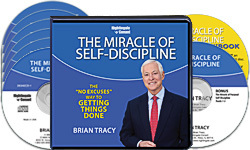 Please send me Brian Tracy’s The Miracle of Self-Discipline: The “No-Excuses” Way to Getting Things Done - including 7 CDs plus Bonus CD and writable PDF Workbook - for just $59.95, which is $20 OFF the regular program price. Take advantage of this limited-time special discount now. GUARANTEE: If I don't experience a life changing miracle in the next 30 days, I will return the program for a full refund. No questions asked. And, just like the 7 CDs, this bonus CD comes complete with action exercises to accelerate your momentum toward achieving every one of your goals. As always, your order is completely risk-free because your satisfaction is guaranteed. You can return The Miracle of Self-Discipline for any reason and at any time during the next 30 days. We'll RUSH you a full refund of the program price or an even exchange—whichever you prefer. Go ahead and click on the order link below. I look forward to receiving your no-risk order, sending you this program, and hearing about which of your 21 life areas you're improving first. Brian Tracy has produced more than 500 different audio and video learning programs covering the entire spectrum of human and corporate performance. These programs, researched and developed for more than 25 years, are some of the most effective learning tools in the world.